Youngster Lucas Piazon is predicting a bright future at Stamford Bridge in the coming years with himself, Romelu Lukaku and Josh McEachran in the side. 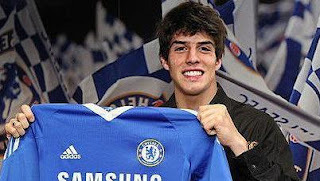 The 17-year-old moved to the club from Sao Paulo for around £5m in March and has been mostly training with the reserves. Lukaku, 18, a big £18m summer signing from Anderlecht who has been compared to Didier Drogba, has been used sparingly but has featured in the Barclays Premier League. McEachran, 18, who has come up through the ranks at Chelsea, has played just twice for the first term this season but big things are expected of the Englishmen. For midfielder Piazon, who also operates as a second striker he believes he can form a good relationship on the pitch with both players in the future and is looking forward to the challenge. "They are very young players," said Piazon of Lukaku and McEachran. "I think they are only one year older than me. They are very good players, playing in games and you can see that in training everyday. I have a good relationship with both players. Lukaku speaks good Portuguese. One day, we can play together and with Josh too, as he is an central-midfielder. It would be good to play with them." Piazon says he has settled into life in London well and has been helped my Chelsea's Brazilians stars David Luiz, Alex and Ramires. "My family was here for two weeks with me also, so it is very easy for me to stay in London. It is not difficult, it is similar to Brazil and I have many Brazilian friends here, it is good" he said. "I like it here. I train with the reserves most days, but sometimes with the first-team. It’s good experience too. I think the Brazilian player at Chelsea who has helped me the most is David Luiz. Alex and Ramires are very good guys too, they have helped me in this last week as I was training with them. We are making good friendships." Piazon snubbed Juventus in favour of joining Chelsea and when asked why he chose England over Italy, he said: "Because I like the Premier League. I think my way of playing and my skills are suited to the Premier League." However, Piazon says he would like to return to Sao Paulo one day, adding: "If one day I go back to Brazil, I would like to play for São Paulo. They were my childhood team, so I have this dream." Piazon admitted it will take him a while to adapt to the rigours of the English game but feels under no added pressure as insists he is still young. "I think I am too young," he says. "Maybe when I get a bit stronger and know better the difference between playing in Brazil and playing here in England. It is very different. Here, every player is expected to defend. In Brazil, we just play with the ball in midfield and in attack. At the beginning, this was my big problem here, so I need to practice a lot and then, I think in one year, or eighteen months, I will be ready to play in the Premier League."